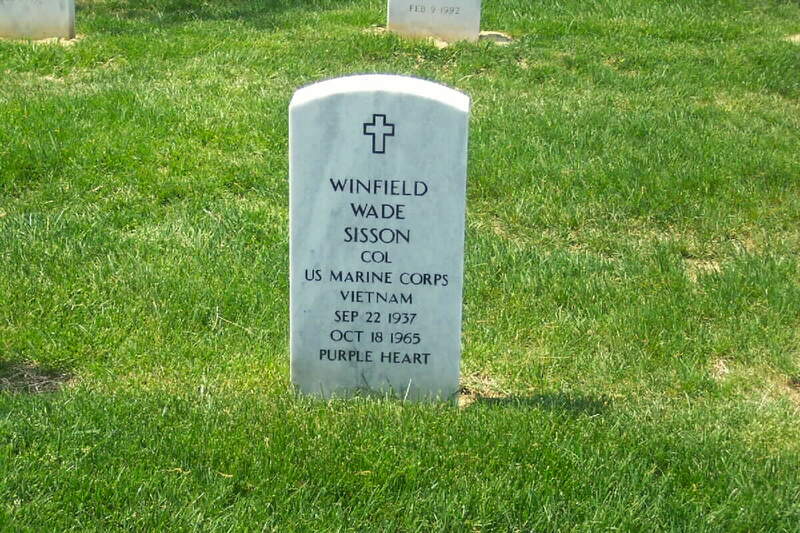 Winfield Wade Sisson was born on September 22, 1937 and joined the Armed Forces while in Berkeley, California. He served in the United States Marine Corps and attained the rank of Major. 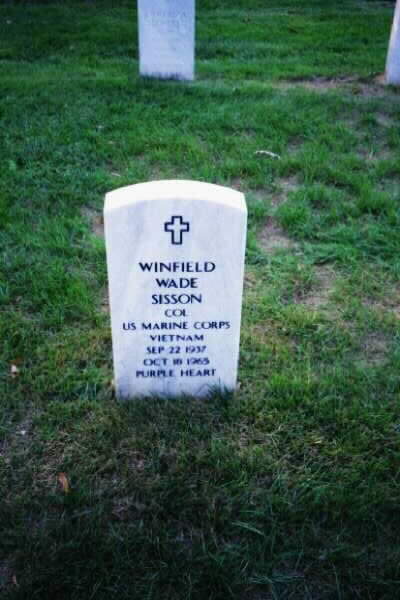 On October 18, 1965, at the age of 28, Winfield Wade Sisson perished in the service of our country in South Vietnam, Quang Nam. Source: Compiled by P.O.W. NETWORK from one or more of the following: raw data from U.S. Government agency sources, correspondence with POW/MIA families, published sources, interviews and CACCF = Combined Action Combat Casualty File. Updated 2001. The remains of two colonels, including a former Berkeley resident who disappeared during a reconnaissance flight over South Vietnam in 1965, have been identified and are being returned to their families for burial, officials said Tuesday. The Pentagon said the remains are those of Marine Colonel Winfield Wade Sisson, an aerial observer from Berkeley, and Colonel Harley Boyd Pyles, a pilot from Enon, Ohio. Officials said the pair had just accomplished a target-strike mission when bad weather apparently caused them to slam their two-seater Cessna into a mountain October 18, 1965. Pyles, whowas piloting the O-1E "Bird Dog,'' was about 10 minutes shy of landing at Da Nang Air Base from Kham Duc, South Vietnam, when he reported low-level cloud cover and rain. He was receiving help from another pilot, but that man's plane was fired upon while landing, officials said. Pyles' attempts to contact the tower went unanswered, and the O-1E never reached the base, according to Major Rene Stockwell of the Joint Task Force Full Accounting, which aids in the investigation of unaccounted-for servicemen in Southeast Asian nations. Air searches were conducted, but intense fighting prohibited officials from conducting thorough ground searches. Relatives of Sisson, of Berkeley, could not be reached Tuesday evening. In an interview with the Mercury News in 1985 -- about 20 years after the colonel disappeared and was later presumed dead -- Sisson's father, Winfield Wilbur Sisson, said he was still holding out hope for his son's return. "I think about him all the time,'' he said. The remains of Sisson and Pyles were repatriated from Vietnam in 1993, and their identities were confirmed in May through dental records and DNA analysis, officials said. The remains of a U.S. Air Force pilot and a Marine Corps aerial observer missing in action from the Vietnam War have been identified and are being returned to their families. On October 18, 1965, their O-1E Bird Dog aircraft encountered low-level cloud cover and rain en route to Da Nang Air Base from Kham Duc, South Vietnam. About 10 minutes out from Da Nang, Pyles attempted to make radio contact with the control tower. No further radio transmissions were received, and their aircraft failed to return to any base. An aerial search was initiated hours later and continued for seven days, but was ended when no evidence of the men or their aircraft was found. Throughout the late 1980s, several Vietnamese refugees reported having information relating to Pyles. None of these reports could be verified; however, in April 1992, a Vietnamese citizen turned over to American officials remains and artifacts that appeared to be those of Sisson. The man indicated the remains had been recovered from a crash site in Thua Thien-Hue Province. Between 1992 and 1995, a joint U.S./Socialist Republic of Vietnam team, led by the Joint Task Force-Full Accounting, interviewed many Vietnamese nationals believed to have additional remains. The Vietnamese government obtained the remains as well as an identification tag bearing Sisson's name. These remains and material evidence were repatriated to the Central Identification Laboratory Hawaii, where the forensic identification process was conducted. In June and July 2000, a joint U.S./Vietnam team excavated the crash site where they recovered remains and personal effects as well as crew-related artifacts. Fragments of prescription sunglass lenses consistent with the eyeglass prescription noted in Pyle's medical records were among the artifacts recovered. There are currently more than 1,900 Americans unaccounted-for from the war in Southeast Asia. For the family of Winfield Wade Sisson of Berkeley, the painful mystery of the Marine Captain's disappearance in Vietnam more than three decades is finally resolved. Two months ago, the family learned the truth with the help of DNA technology: the 28-year-old pilot was killed when his plane crashed into a mountain in October 1965. Pentagon officials released the identification this week. "It puts a chapter to rest," his cousin, Kim Sisson of Grand Rapids, Michigan, said yesterday. "War is hell on families and people. He's always been in our minds. We didn't know what happened to him. We thought he was a prisoner all these years. It's been a big question mark in our life." The answer came after the U.S. military used DNA technology to determine the identities of human remains found more than 25 years after the crash. 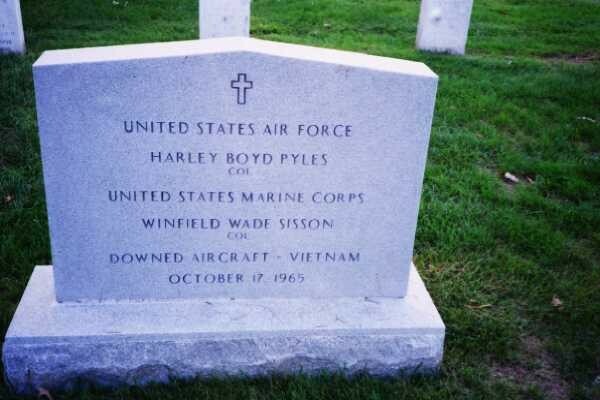 On October 18, 1965, Sisson and Major Harley Pyles had completed a reconnaissance flight near Da Nang Air Base when their Cessna airplane ran into bad weather and crashed. Their unidentified remains were recovered in 1992 by a local resident who turned them over to U.S. military officials. It took almost nine years for the Pentagon to make a positive identification of both men with the help of DNA technology, which the military began using to identify missing servicemen only in 1995, said Larry Greer, a Defense Department spokesman on prisoners of war issues. Such testing is commonly used in confirming the identities of suspects in criminal cases. Today, DNA technology also helps verify the identities of about 40 percent of 200 to 300 missing servicemen every year, Greer said. Veterans rights advocate Michael Blecker of San Francisco said the new technology helps relatives of missing servicemen heal. About 1,900 U.S. servicemen are listed as missing in action in Vietnam, according to the Pentagon. More than 58,000 Americans died in the war. For years, Sisson's family struggled to find out what happened to him. His father, Winfield Wilbur Sisson, himself a former military officer who taught mathematics at the University of California at Berkeley, traveled frequently to Washington, D.C., hoping to get information. The elder Sisson later joined relatives of other missing servicemen who opposed the U.S. government's reclassification of their loved ones from missing to killed in action. Greer said the move was standard practice to allow the families of missing servicemen certain benefits, such as government insurance. But he said the Pentagon never stops looking for missing personnel. Sisson's father, who lived in Berkeley, died in 1995. His brother, Dr. Keith Sisson of Grand Rapids, received the younger Sisson's remains. Winfield Wade Sisson, who was later conferred the rank of Colonel, will be buried at Arlington Cemetery next month. "I can remember my brother and this hope that he had that his son would walk through that door someday," Keith Sisson said. "Arlington would be very fitting." Winfield Wade Sisson was honored in his hometown six years ago when Berkeley city officials and folksinger Country Joe McDonald paid tribute to the city's 22 casualties whose names were inscribed on a plaque. Their stories are posted on a Web site, www.ci.berkeley.ca.us/ vvm/ . "It must have been terrible for his father to endure this," McDonald, a former antiwar protester, said. "War injuries never seem to end. The sacrifices people make have repercussions that go on and on. This is a perfect example." Clark County pilot's remains being returned to family A U.S. Air Force pilot from Clark County and a Marine Corps aerial observer from California - missing in action from the Vietnam War - have been identified and are being returned to their families. The Department of Defense, in a release issued Tuesday, identified the men as Air Force Col. Harley B. Pyles of Enon and Marine Col. Winfield W. Sisson of Berkeley. "The support of the Socialist Republic of Vietnam enabled us to account for these servicemen, and we look forward to continued cooperation," said Alan Liotta, acting deputy assistant secretary of Defense for POW/Missing Personnel Affairs. According to the defense department, Pyles and Sisson's O-1E Bird Dog aircraft encountered low-level cloud cover and rain en route to Da Nang Air Base from Kham Duc, South Vietnam, on Oct. 18, 1965. About 10 minutes out from Da Nang, Pyles attempted to make radio contact with the control tower. No further radio transmissions were received and their aircraft failed to return to any base, according to the defense department. An aerial search was initiated hours later and continued seven days but was ended when no evidence of the men or their aircraft was found. Throughout the late 1980s, several Vietnamese refugees reported having information relating to Pyles. None of these reports could be verified. In April 1992, a Vietnamese citizen turned over to U.S. officials remains and artifacts that appeared to be those of Sisson. The citizen indicated the remains had been recovered from a crash site in Thua Thien-Hue Province and that an acquaintance had additional remains. The Vietnamese government obtained the remains as well as an identification tag bearing Sisson's name. These remains and material evidence were repatriated to the Central Identification Laboratory Hawaii, where the forensic identification process was conducted. An analysis of the available evidence suggests that Pyles and Sisson died in what is now Thua Thien-Hue Province, Vietnam, when their aircraft crashed on the side of a mountain, according to the defense department. There is no evidence either man survived the crash. Human remains were recovered by local villagers who scavenged the crash site, as well as by CILHI personnel who excavated the site. Some of the remains were confirmed to be those of Pyles and Sisson on the basis of dental records and DNA analysis.